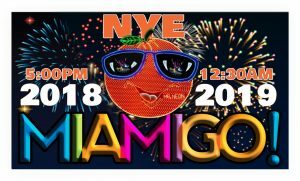 Join Miamigo TV for the 2018 New Years Eve Celebration at Bayside Market Place. Streaming all of the incredible activities, on Livestream, front stage. For more information and details on this incredible event please check us out online at Miamigo.tv. Stay Tuned on any of our social media channels for updates of performers, activities and special interviews. Check out some of Miamigotv’s past streams of the Big Orange New Years Eve Celebration Here. Greater Miami Host Committee/LiveStream/Miamigo present the Launch of the Big Orange over Downtown Miami starting at 10pm. Join us as Miami comes ALIVE and rises to the top!!! LIVE from Bayside Marketplace, on the water’s edge of Biscayne Bay & the Port of Miami. Stop by and share your wishes for the New Year! This entry was posted in Uncategorized and tagged #cgaf, #FUN, #MIAMI, #miamitv, GREENSCREENMIAMI, JAZZ, MIAMIGOTV, MUSIC, MY HOOD. Bookmark the permalink. From the sun fun capital of the world, all of our friends come together to share a taste of this tropical culture. From music videos to Festivals and Events... take a moment to experience the true taste of Miami!